Full list of sites in this study: Facebook, LinkedIn, MySpace, Twitter, Slashdot, Reddit, Digg, Delicious, StumbleUpon, FriendFeed, Last.fm, Friendster, LiveJournal, Hi5, Tagged, Ning, Xanga, Classmates.com, Bebo. To get consistent age data for the various sites we used site demographics information for the United States gathered from Google’s Ad Planner service and then did some additional calculations to get all the data we needed. What is the age distribution in the social media sphere? We took the age distribution data we had collected and calculated what the age distribution looked like across all 19 sites counted together. The resulting chart is right here below. A full 25% of the users on these sites are aged 35 to 44, which in other words is the age group that dominates the social media sphere. Only 3% are aged 65 or older. That was the age distribution when looking at these 19 sites together. When looking at individual social network sites, the differences are significant, as you will see below. 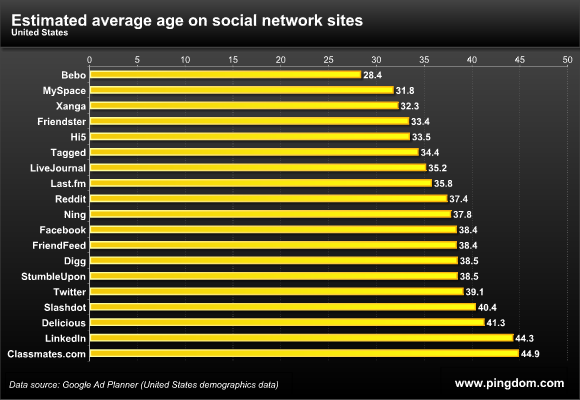 Here below you can examine the age distribution for each of the 19 social network sites we included in this study. The list has been sorted by the average user age per site (see further down for that), with the “youngest” site showing at the top and the “oldest” at the bottom. Bebo appeals to a much younger audience than the other sites with 44% of its users being aged 17 or less. For MySpace, this number is also large; 33%. Classmates.com has the largest share of users being aged 65 or more, 8%, and 78% are 35 or older. 64% of Twitter’s users are aged 35 or older. 61% of Facebooks’s users are aged 35 or older. Most of the social networks we included are dominated by the age group 35-44, which was apparent in the first chart in this article. This group has become the most “social” age group out there. This is the generation of people who were in their 20s as the Web took off in the mid ‘90s. It’s a bit surprising that not one single site had the age group 18 – 24 as its largest, but that can be explained by this interval being a bit smaller than the other ones (it spans seven years, not 10 as most of the others). That the two oldest age groups don’t top any of the sites probably doesn’t surprise anyone, though. As we promised in the introduction, we have calculated an estimate of the average age for each of the social network sites included in this study. The result is here below. The average social network user is 37 years old. LinkedIn, with its business focus, has a predictably high average user age; 44. The average MySpace user is 31 years old. Bebo has by far the youngest users, as witnessed earlier, with an average age of 28. Although we can’t say how this will change over time, at the moment the older generations are for one reason or another (tech savvy, interest, etc.) not using social networking sites to a large extent. This probably reflects general internet usage, but we suspect the difference is enhanced when it comes to the social media sphere where site usage tends to be more frequent and time-consuming than usual. It is also noteworthy that social media isn’t dominated by the youngest, often most tech-savvy generations, but rather by what has to be referred to as middle-aged people (although at the younger end of that spectrum). from 18 to 24 only 9 % !!!! I trust your hard work on the statistics so I’m assuming it’s correct ! ppl in this age are mostly college students ! !that’s pretty interesting ! Your studies continue to be very interesting and valuable…thanks for this information! Whereas I’d love to know more about your statistics. I’d love to cite your study in an article, but can’t until I know more about the data. Any help? Why the hell dont u publish Orkut info! It would be highly interesting to have this data on a global / international basis. Any further details coming up? But does the statistics count all subscribed users or only active accounts? Many people subscribe to try but never go back because they don’t like. @jumana: why do you trust the stats offered here? just curious. I didn’t notice the links to sources here. Why do you assume this? I am 40, and spend my entire day online. Many of my associates and friends – in the same age group do as well. I buy online, read online, use itunes for music and movies – the whole deal. Older people don’t use social networking just because it’s really not that useful. I’ll be brave and speak for the group here: using social media throughout the day basically just shows you who’s bored and who’s wasting time at work. The things people tweet are random thoughts that interrupt others while willingly exposing your interests to marketers. I am too busy to use social media and unless you are willing to invest large amounts of time and effort into it (the proven success recipe for almost anything) – then it’s a waste. Look at these facebook stats (http://www.facebook.com/press/info.php?statistics) OMG – 55 minutes per day!!! What would happen if we all went for a 55 minute walk per day?? I am fifty years old and my use of the social networks is starting to explode. I am not a very technical person, but I love being connected. I use facebook and I have started a blog. What about gaiaonline (http://www.gaiaonline.com/)? It’s an anime social network site that’s very well done but the age group there appears to be mostly teenagers even though I’m a member mostly due to what the site is about and not necessarily the people I associate with. I would have liked to seen the avg age of this site as well. ‘Older’ is a relative term. With an average user age of social networks falling somewhere in the 30’s I’d say social networks are primarily being used by ‘older’ people. does it include age protections like setting the age to +70 years in order to protect the under-ages? This is an interesting report, but do you have the sources? I know you said “To get consistent age data for the various sites we used site demographics information for the United States gathered from Google’s Ad Planner service and then did some additional calculations to get all the data we needed.”, but it’d be good to have the details of your “additional calculations”. Thanks! @Alvin Poh: The age groups percentages for each site are directly from Google Ad Planner. The calculations were simply to average these values to get overall statistics and average ages. Nothing complicated. And of course, make the charts. The post is very interesting, but it seems to me that it relys only on some part of the story. I mean, this is the data about people that subscribed and we don’t have here the amount of time people spend on the social networks mentioned. For instance, maybe the number of youngers that access are not so huge as the 35-44, but the amount of time that people from 10-24 has to invest on social networking (and the need for it) is much bigger than the 35-44. I think this is a little skewed because there are several factors that don’t give an accurate account of who is working these sites. For instance, is the age determined by what is selected at registration? Because some of these sites require that you are 16 or older. Some people hide their age by just dropping in 99. Also, I think 35+ are signing up for these sites but their activity is really low. So they keep picking new networks to try. Not to mention that sites like Twitter are so over run with marketing experts eager to get an edge. Which means they are on and active, but not necessarily a true demographic to market to. And more than likely they are older. Also, throwing things in like LinkedIn and Classmates throws it off a little too. Their functions seem to fit older professionals (especially LinkedIn). That’s my take. I still think that the younger generation is probably the most powerful demographic on the social networks. They are more likely to pass info along through social networks and click on links because they can multitask better and are interested in more random things. Why average age, and not median age? Median seem like a far more useful metric for evaluating social networking sites. Also, by making the buckets so different in size, it’s very difficult to compare any of the stats to the 18-24 age group. Bucketing at x8-x7 consistently would make the graphs more readable. Anyway, thanks for the stats, but as they are, they don’t seem very useful. So I’m not a statistician, nor a “social media expert,” but these numbers and analysis seem a bit dodgy. If I’m reading these graphs correctly, over 50% of Bebo’s users are under 24, yet the average age of Bebo users is 28.4 years? And saying “18 – 24: Tops no site” seems kind of meaningless as it compares an age range of only 7 years to others that are of 17 years, 10 years, and indefinite lengths. I’m not saying that tranche doesn’t make sense in-and-of-itself, only that it doesn’t make sense to compare it apples to apples. Still, the “age distribution across different social networking sites” is interesting, as it shows a clear division between sites used by a “younger” crowd (Bebo, Myspace, Xanga, Livejournal, Hi5, Tagged) where more than 50% of the users are under 34, and the rest. broadly, the findings appears valid, from my experiences over .net. Regarding why we chose the age groups (intervals) that we did, as some of you ask: Those are the ones provided by Google Ad Planner. They were not chosen by us. But we agree, it would have been nice to have equal-sized buckets straight through. @Blindsight: Since we only have groups of ages to work with, we can’t calculate a median. We can only estimate an average. @Scott Leslie: Here’s an (extreme) example for you to explain how the Bebo thing you mention can happen: Three people, two aged 29, and one aged 60. The average age of those three is (29+29+60)/3 = 39. Even though a full 67% of those people are under 30. This shift is extreme, and we suspect that this is why Blindsight wanted to see a median instead, but we can’t do that since we don’t have all the individual ages. The reason for the shift is because we assumed that the average age in the 0-17 bracket isn’t in the middle of that because kids aged 0-5 or 6 probably aren’t heavy users on these sites… so we counted it more like a 7-17 age bracket in practice which is more reasonable. What about Habbo? Bigger concern – It’s a bit misleading to say the “millions and millions” of social network users when your data relies on Google’s estimates for US users. What about the other millions and millions of international users? Further, Google data likely has more skew than awknowledgesd: 1. it aggreates search and google analytics data to 3rd party data. There is no guarentee that these sources actually contain representative proportions of each demographic. 2. consumer panel data and 3rd party data are notoriously week on respondents under 18 years old because of legal issues involved with working and contacting with them. Unless you know the id of the underlying 3rd party data provider, you can’t tell how skilled they are at addressing this bias, and anyway, panel data, while intended to be representitive, is highly susceptible to biases. Great study. Interesting to see so many people jump on criticizing the methodology without even taking a minute to understand where your data comes from. I love Google Ad Planner, but it might be interesting to do the same analysis with demographic averages from services like Quantcast, Compete, Alexa, MSN AdCenter Labs, etc. I’m 55 and I spend quite a bit of time using Stumble. I’m not at all interested in any social networking. It’s a waste of time. I have no interest in telling anyone else what I’m doing or planning to do. Why should they care what I’m doing? Lastly, who would I network with anyway? Since most all my friends are close to my age and they aren’t interested in social networking either. My eyesight isn’t good enough to see the keys on my cell phone (without my glasses) so I couldn’t twitter even if I wanted to. I’d much rather use the telephone and talk to someone if I feel the need to socialize. 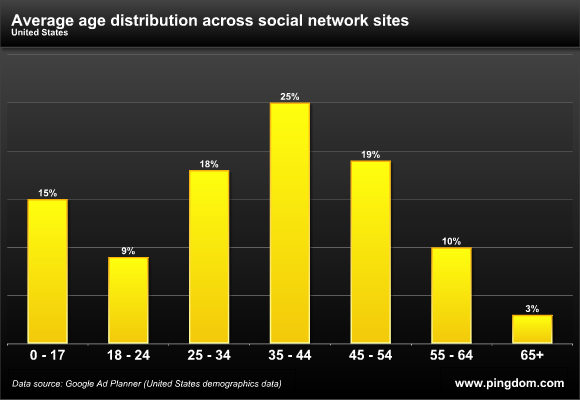 Age brackets seem very evenly distributed across Facebook, which on its own makes for quite a different story I think. Another thing, possibly a red herring: I know my young niece says she is much older on Facebook. I suspect it’s a parent-driven thing, to ward off grooming. I wonder if many other young people are doing this, and skewing the age demographics? I don’t know the distribution of ages in the general population of all living people among these age brackets. But it’s something one could look up at http://www.census.gov in a half hour. I raise this because I don’t care how the usage is spread among age groups. What I care about is what percentage of 18 year olds can be found on Facebook, and what percentage of 50 year olds, etc. There are a kajillion other relevant issues, like who uses Facebook for family only versus who uses it to join groups or cruise fan pages. The time online each day is very relevant. But all along, when I’ve heard that my age group (50) is growing the fastest on Facebook, my only question has been, ok, what percentage of my high school class is on Facebook today, versus a year ago, and versus a year from now? My anecdotal experience is that critical mass was reached a while back and soon everybody who participates in economic, intellectual, and civic life (i.e. everybody except the world’s Unabombers and weird cult members) needs to be there. Social media is dying. I am 32 and quit all my accounts in December. My friends who are aged 18-40 are doing the same thing. Professionals want to keep work/home separate and the only way to do that is to go old-school. My friends who have quit are expressing the same thing as me: we’re getting more work done and connecting more with friends/business associates who matter most. Celebrities and Businesses hesitantly use Social Media for PR but they will all quit ASAP- there is work to get done and play to be had so we can’t all be bogged down with social media’s time wasting attributes. Also- the data won’t be accurate. My sister has 3 FB accounts so she can play Mafia Wars- my mom has two. They’re not alone. I have friends who have listed their ages as 14 or 99 to avoid being pulled up in searches. This is pretty insightful! I would never have guessed that the average age was so high. I would guess 18-34…not an average of 37! Great report. Only ~75% of American even use the Internet. That number has been pretty stable for a while now. We’ve still got a long way to go before saturation. While interesting, this chart commits the routine error of lumping together everyone who is 65 years old and older. My 69-year-old sister and my 89-year-old mother-in-law have little in common, other than both use FaceBook. Average age of the people at Google Ad Planner who chose these arbitrary age groups? I’m guessing 31. This is interesting information, but as a facebook user who has frequent contact with young people I wonder how distorted these figures are by exaggerated age claims. I observe significant numbers of 8-18 year olds who have dates of birth making them 10 years older than reality. Have you any data on this aspect? It’s not an arbitrary choice, it’s simply that people over the age of 65 represent such a small proportion of Internet users, that further splitting the demographic wouldn’t provide any meaningful information. Very interesting study! I find that the age of the average social media user is 37, which correlates with the average age of the entrepreneur is 40.. And this age group dominates? Very interesting data.. Thank you so much for sharing! I’m personally aware of hundreds of children between the ages of 9 – 13 are on facebook that are posting false ages since they are not allowed to signup until they are 13. This is only in the networks I’m aware of. I’m sure it goes much beyond that. This fact clearly will skew numbers. It’s always a mistake to cite data that supports personal prejudice and ignore statistical findings that don’t support pre-conceived opinions. Here’s the quote: “the older generations are for one reason or another (tech savvy, interest, etc.) not using social networking sites to a large extent.” However, if you look at the first chart, people 45 and older collectively account for 32% of total networking usage. How do you define “to a large extent?” While the percentage of that total age group using the sites may not match the percentage of younger people on the sites, the older users account for almost one third of the total users on all sites. That is not statistically insignificant, no matter what preconceptions you hold about internet users. In addition, the sheer numbers of people 45 and up are what accounts for the fact that America is said to have a statistically aging population. The demographics of this group, and the wealth and buying power they represent makes them a group marketers know better than to shrug off. Not tech savvy? The baby boom generation is recognized to be made up of life-time learners. They’ll either figure it out themselves, take a class, ask their grandchildren, or pay an unemployed twenty-something to do it for them. I found something interesting. The age group of 18-24 did not top any social networking site. It struck me as interesting because Facebook for example was created by college and for college students originally and the standard college ages are lacking in presence. So I pose this question. Could it be that the age group of 18-24 is not on social networking as a high of a caliber as others because this demographic engages in text messages more than computer mediated communication? Well shoot, then I’ll have to stop putting I’m 99 on Facebook. interesting post and great visuals! @Tony Sylcester i would come to think that they would run parallel with one another; although i don’t have the data to conclude this! I can see the amount of hardwork you have put into the research. but there is questions with regards to the results. They honestly, in my personal opinion, dont look accurate assuming the frequency of using the social network is the same. Maybe you could provide the average frequency of usage per age group. I will really help in your justification. Are there updates for these statistics? Social media is not dying at all….its just beginning to explode! You can see the statistics for yourself! The graphs on this page show how social media is rolling in the strongest demographics possible. That’s why websites like mine at http://hissingkitty.com are able to get fans from places we never would have reached without social media. im 22, i work for an interactive firm. I grew up using most of the social networking sites . . . . The reason that there is not really any ages between 17-24 is because most of teenagers lie about their age to act older. .. . i did it myself. Young kids who were really 15, lie and say that they are 25. These stats are useless and aren’t accurate. 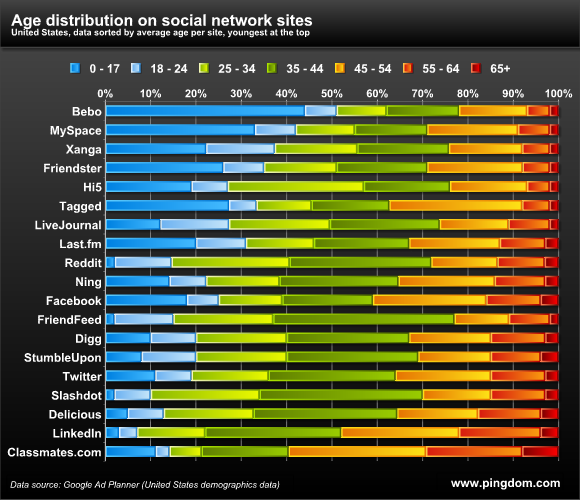 Interesting to see the age group that dominates the use of social networks. I personally thought that it will be the a match between the 25-34 and 18-24 considering these groups are more tech savvy when it comes to their mobile gadgets that allows them to connect easily to social networking sites. It is indeed the era of modern technology where people regardless of their location can quickly communicate and share information with others. This is what social networking platforms can do. Imagine being able to engage in a conversation with individuals that share the same interest and passion as you do? Basically, you are saying that someone like me, aged 43, is getting too old to be on the most popular social media sites such as Facebook, Twitter and like sites. So social networking is for the young?! Maybe I should remove myself from the most popular sites and seek out old people’s places to go!